"New York Millionaires Tell Albany: Tax Us, Please"
Do you want your reps to take action on the Trump tax cuts that unfairly benefit the rich? Do you want your reps to take action on the Trump tax cuts that unfairly benefit the rich? Read more from The New York Times below, and click above to contact your reps and make your voice heard today! This was no joke: The millionaire was Morris Pearl, a former BlackRock executive who is the chairman of Patriotic Millionaires, a group dedicated to pushing for higher taxes on businesses and the ultrarich. Testifying on Tuesday at a state budget hearing, Mr. Pearl asked a bipartisan group of about half a dozen legislators to create a new “multimillionaire’s tax” on households earning more than $5 million a year in order to fund new affordable housing, infrastructure and schools. Of the more than 200 members in the Patriotic Millionaires, 41 live in New York, a state known for its high wealth and high taxes. Their message arrives at a decisive moment: Democrats control the State Legislature and the governor’s mansion for the first time in a decade, and the ascendant progressive wing of the party is increasingly clamoring to narrow the income inequality gap, both in New York and nationwide. Several Democratic state legislators, as well as the City Council speaker, Corey Johnson, last week threw their support behind a so-called pied-à-terre tax, on wealthy people’s pricey secondary homes, after a hedge fund billionaire bought a $238 million penthouse on Central Park. Senator Julia Salazar of Brooklyn was elected in November as the Legislature’s first democratic socialist. Nationally, Representative Alexandria Ocasio-Cortez recently popularized the idea of taxing income above $10 million at 70 percent. And Senator Elizabeth Warren of Massachusetts is running for president on a promise to fight income inequality, with Senator Bernie Sanders of Vermont, a self-declared democratic socialist, considered a possible candidate as well. At the same time, lawmakers here have rejected the new proposals to tax the ultrawealthy. Gov. 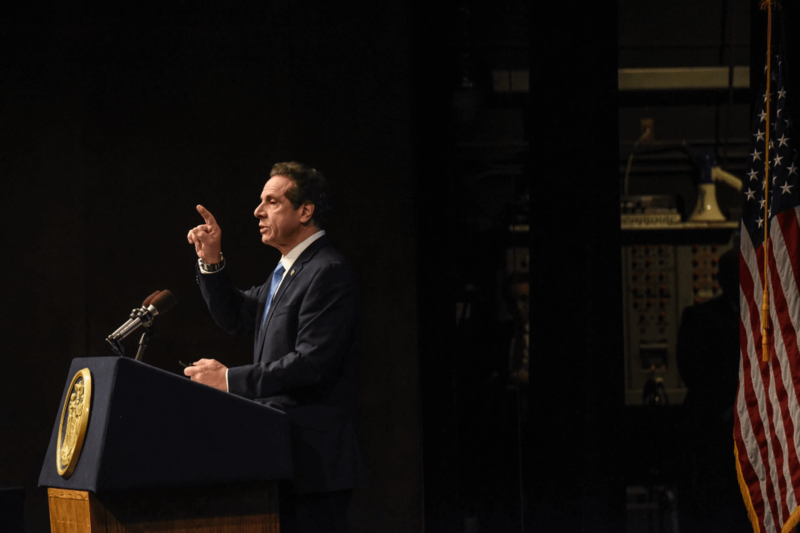 Andrew M. Cuomo in particular has spent the past week loudly disdaining the idea of an expanded millionaire’s tax, even as he has projected a state budget shortfall of $2 billion. The wealthiest 1 percent of New Yorkers control about 31 percent of the state’s income, according to data from the Economic Policy Institute, a Washington-based think tank. They also account for half of the state’s income taxes, according to Mr. Cuomo. The State Senate’s Democratic majority leader, Andrea Stewart-Cousins, of Westchester, has also dismissed the idea of new taxes. Of course, progressive activists have argued for years that higher taxes on the rich would not hurt the state’s economy. But the Patriotic Millionaires’ hope — and that of the grass-roots groups aligned with them — was that the message would have more weight coming from, well, the rich. “New York will always be New York. There’s no other place like it, and millionaires are concentrated here because of that,” said Abigail Disney, the great-niece of Walt Disney and a member of the Patriotic Millionaires. The state’s current tax on high earners, which was branded as a millionaire’s tax but affected people earning more than $300,000, was introduced in 2009. Between then and 2016, the number of millionaires filing taxes in New York increased by 72 percent, with those millionaires’ total income increasing by 54 percent in that time, according to the Fiscal Policy Institute, a union-backed nonpartisan think tank. Non-millionaires’ income increased by 33 percent in the same period. The coalition also includes investment bankers, a psychologist, a home furnishings mogul and Friedrike Merck, an heir to the Merck pharmaceutical empire. Mr. Pearl said he had not met with Mr. Cuomo but had left several voice mail messages for the governor’s counsel, Alphonso David. He also said he had met with Ms. Stewart-Cousins and the Democratic Assembly speaker, Carl E. Heastie, though not recently. In addition to creating a new multimillionaires’ tax, which the group said could raise $3 billion each year, the Patriotic Millionaires also want to close the carried interest loophole, which allows hedge fund managers to pay a much lower federal tax rate on much of their income. Ms. Disney and Mr. Pearl said they also would support a pied-à-terre tax on properties such as the $238 million Central Park penthouse bought by Kenneth C. Griffin, though the group has not taken an official stance. “If people like Mr. Griffin, who bought a $200 million-dollar-plus apartment in Manhattan, paid more taxes, some of these millions of dollars could do a lot for the schools upstate,” Mr. Pearl told lawmakers. Mr. Cuomo has backed closing the carried interest loophole, and his aides said he would consider a pied-à-terre tax. But he has openly mocked calls for an expanded millionaire’s tax — especially in light of new federal tax laws that Republicans passed in 2017. According to Mr. Cuomo, those changes fell hardest upon New York’s highest earners. Neither Ms. Disney nor Mr. Pearl denied that the federal tax changes had cost them more — but in part, they said, because they did not actually know if that was the case. “To tell you the truth, I’m not sure exactly,” said Mr. Pearl, adding that most of his income was earned through capital gains, which are taxed at lower rates than normal income.